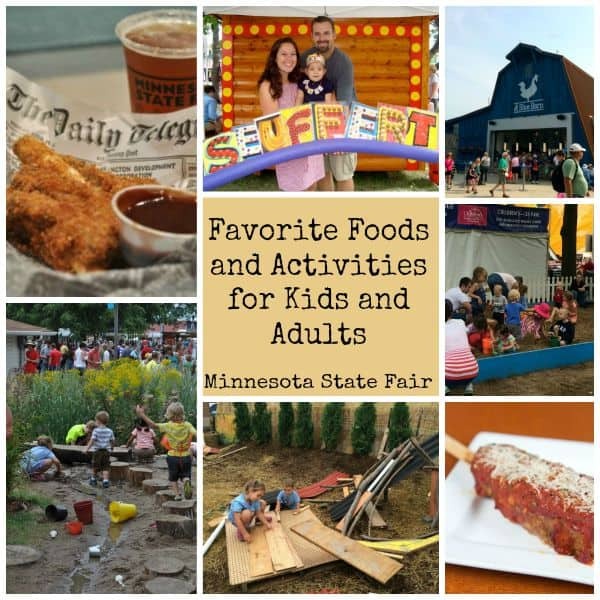 Food and Kids Activities at MN State Fair that are perfect for both kids and adults! Not Just for the Kids! Who is having more fun here? The picture above is one of my very favorite pictures I’ve taken at the Minnesota State Fair. I know the State Fair isn’t for everyone. We all take different bites of the Minneapple don’t we? I won’t force you to eat Lutefisk and I certainly won’t force you to love the Minnesota State Fair. 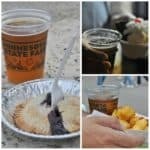 But the one thing I will say is that Minnesota State Fair is not just about crowds, heat, spending lots of money, people watching and deep-fried foods. See that picture above. That’s one thing it is to me. Memories and tradition. I love that as both adults and children, we can laugh and smile and find joy together. 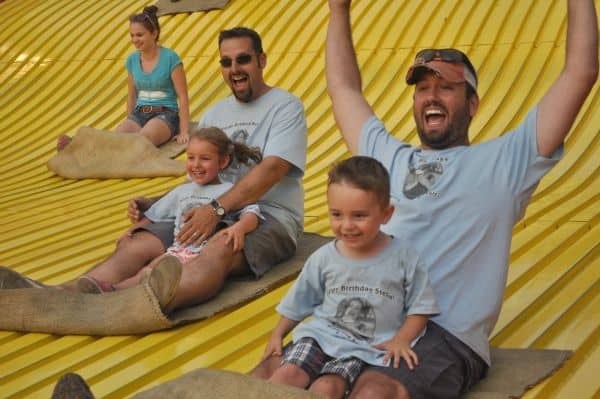 Maybe you find joy together on the Giant Slide, talking to your kids about farm life and sitting on a tractor or showing them your entry in the seed art or canning competitions. 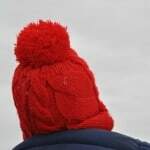 Maybe your joy is taking one day a year, making it your family day, wearing matching shirts and doing just the things only you love and understand as a family. Maybe it is about teaching your children to be proud to be a Minnesotan. Whatever your reason, wherever you go and spend your time, money and energy at the Fair, enjoy it. Laugh and make memories. Ask most Minnesotans and they will tell you their Minnesota State Fair memories as a child. It’s once a year, just like we anticipate summer, we anxiously wait for the Minnesota State Fair. It is bittersweet isn’t it, the end of summer, the start of school, but what a great way to celebrate. New in 2014, we wandered into this area after picking up a cup of coffee. We felt like we hit a goldmine. This play area is just north of the Baldwin Park area and is a perfect place to let your kids get outdoors and use their imagination. 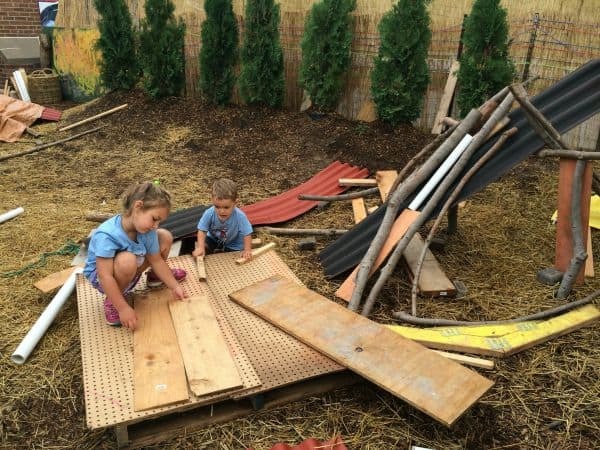 Our kids loved using the materials to build a fort, dig in the dirt and navigate the winding river of water. Parents can help the kids or just sit back and sip their coffees and watch the kids imagination run wild. This is right at the entrance of the Eco Experience and each day the first 800 kids who visit the Eco Experience receive a free toy dog kit from YOXO (Yax-oh) a Minnesota company. The Eco Experience is located in the Progress Center on Randall Avenue. Our kids are really into tools and building right now so stopping at the Home Depot Kids Workshop will be a must in 2015. I love that parents and grandparents can pick a project and build alongside the kids. The area is built like a horseshoe so the Home Depot workers can go along the edge and help the kids. They have 6 different projects that kids can choose from (examples include toolbox, helicopter, bug basket, calendar, birdhouse). The project hours are 9 am.-noon and 1-5 p.m. daily at the fair. This is a free activity. Home Depot is located on Murphy Ave, across from The X-Zone. 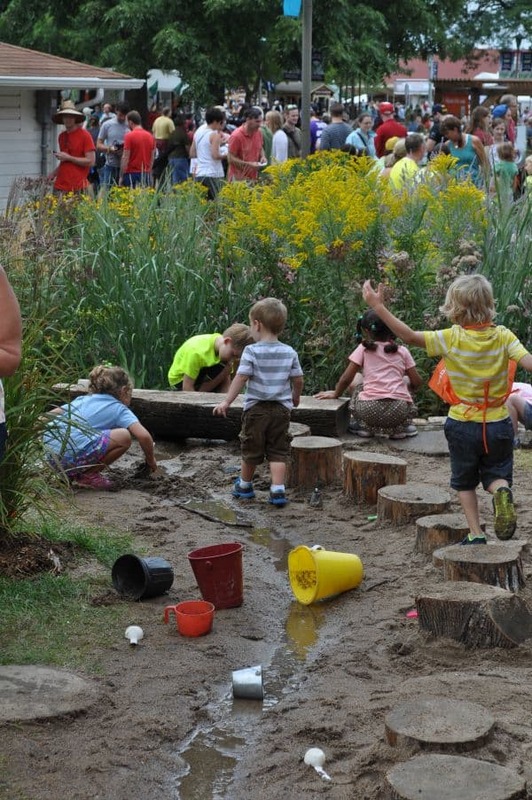 A must stop for families, the Balwin Park area features several, fun and educational activities. 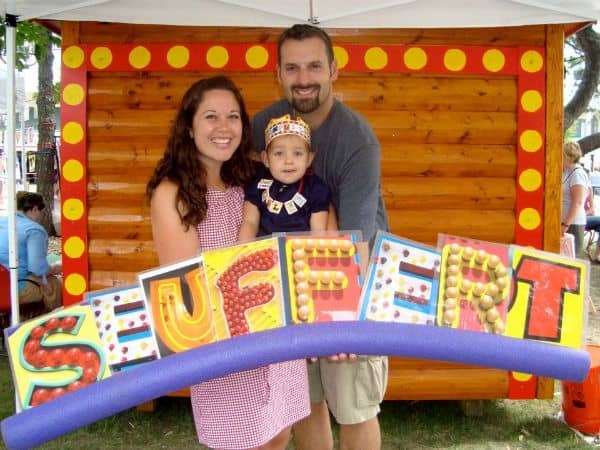 In Alphabet Forest you can take pictures with Fair Letters, create letter necklaces, meet authors and even play a word hunt game to earn a blue ribbon. Math-On-A-Stick is a new activity in 2015, where parents and kids can explore math concepts. 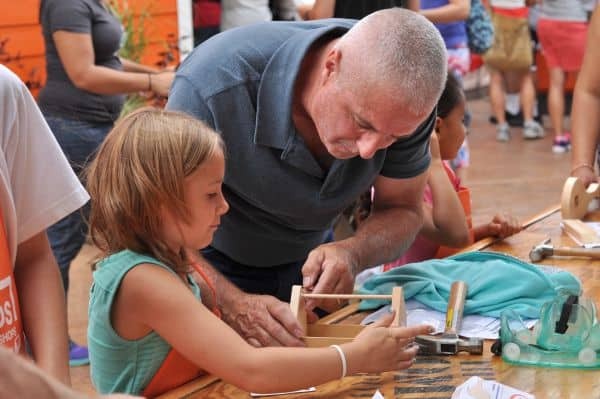 Activities include creating designs and patterns with tiles or playing the Numbers Game scavenger hunt and earn a prize. Parents can post pictures on Instagram using the hashtag, #statefairnumbers. Baldwin Park also includes a stage with a variety of free entertainment and a giant sandbox. 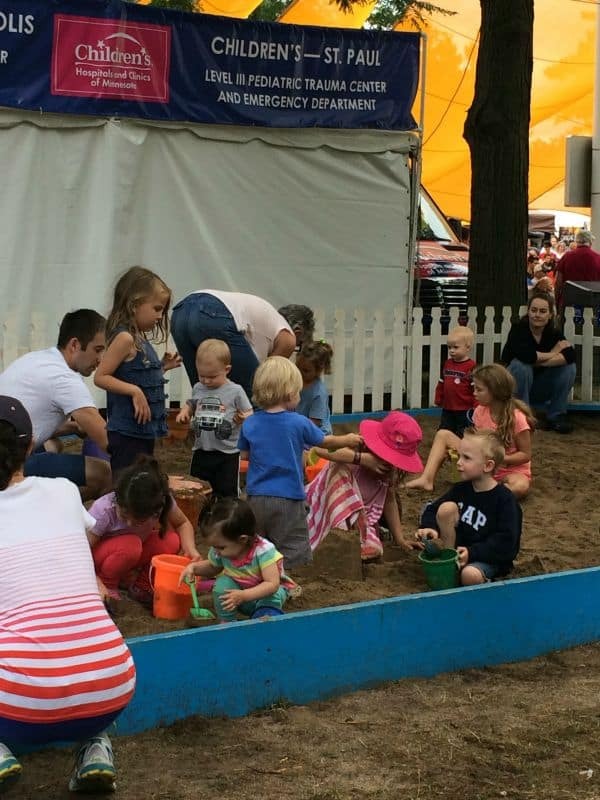 The State Fair’s Family Fair at Baldwin Park includes the Alphabet Forest, Math On-A-Stick, Giant Sandbox and a variety of free entertainment. Baldwin Park is north of the Kidway at Copper and Randall. 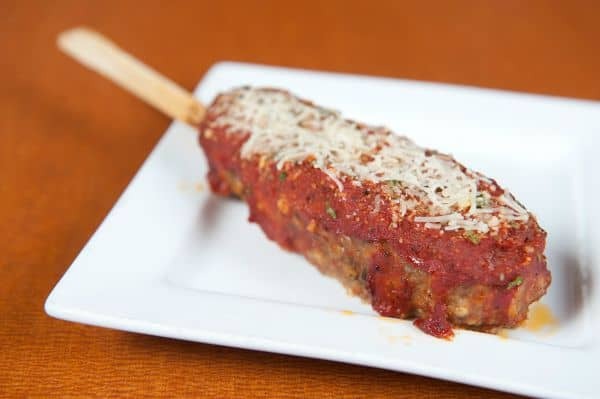 Our family loves hanging out in Baldwin Park and this Italian meatloaf will be in our hands as we check out all the fun kid activities. 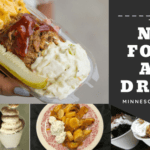 Portable comfort food; this is the Minnesota State Fair. 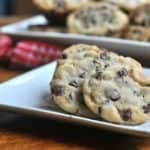 I tried this and ate every last bite, perfect for the kids and adults. I love the pepperoni and savory marinara sauce. And really love that Green Mill is a community establishment in my home city of St. Paul. This meatloaf is also included in my 10 New Foods You Must Eat at the Minnesota State Fair. Melt in your mouth buttery french toast with berry sauce, whipped cream and pop rocks. 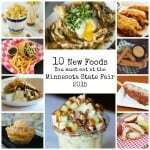 It is a fact that if I could live at the Minnesota State Fair, I would live at the Blue Barn in the West End Market.This vendor is turning out serious food competition perfectly fit for the Minnesota State Fair. 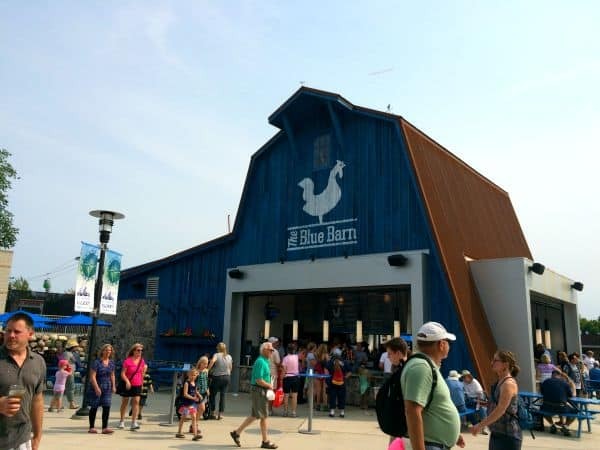 If I could only eat at one Minnesota State Fair vendor stand, the Blue Barn would be it. Cowboy Dave’s Cluck and Moo, Blue Cheese Corn Fritz, Chicken in a Waffle, Caramel Apple Pi beer and now, the Pop Rock French Toast. Every foodie in Minnesota is talking about this new french toast. Kids and adults love pop rocks and when you combine pop rocks candy with breakfast it has to be a winner. When I hit the fair with my family on Friday, I will be eating this and I might share with the kids. Just when you think a food can’t get any better, we deep fry it. Right? I loved these fried baby back ribs-super tender on the inside and the flaky on the outside. This was a perfect pairing for my Lift Bridge Beer Company Mini Donut beer. I had a chance to talk to the owner of the Ball Park and loved hearing his passion for developing this recipe. This is a win, folks. Grab a couple baskets of these ribs and sit down with the kids to catch a game on tv and get mom and dad one of their craft beers on tap. These ribs are also included in my 10 New Foods You Must Eat at the Minnesota State Fair. 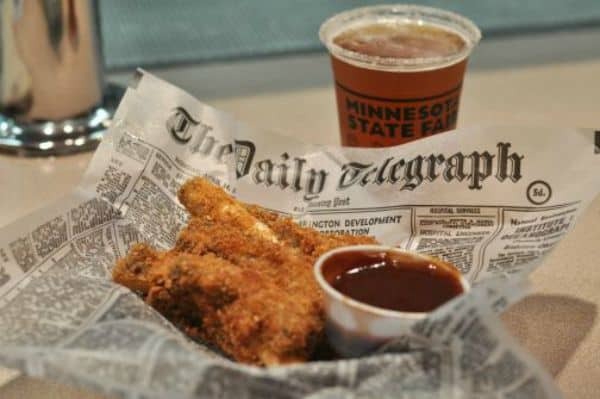 Want more 2015 Minnesota State Fair Food ideas? 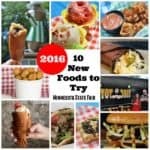 Check out my top ten list of foods to try! 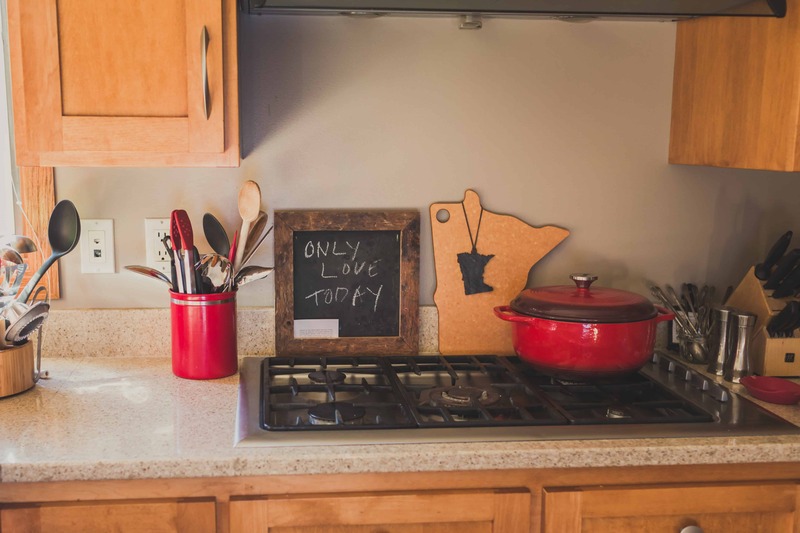 This entry was posted in Fun and tagged kids activities, Minnesota, minnesota state fair, mn state fair by Alice Seuffert. Bookmark the permalink.